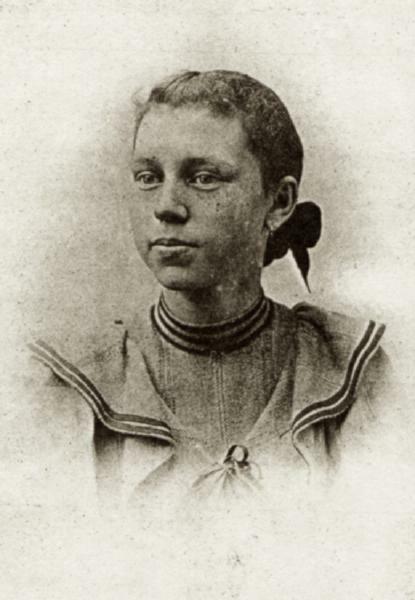 Elizabeth Susan Barnett was born on 24 March 1877 in New York or 1878. She was known as Libby. George W. Barnett and Elizabeth Kammerer appeared in the US federal census of 1 June 1880 in Buffalo, Erie County, New York, at 164 Church Street. Other members of the household included Elizabeth Susan Barnett, Sarah Elizabeth Barnett and Louise Margaret Barnett. George W. Barnett and Elizabeth Kammerer appeared in the US federal census of 1 June 1900 in Buffalo, Erie County, New York, at 123 Waverly Avenue. Other members of the household included Elizabeth Susan Barnett, Louise Margaret Barnett, George Jacob Barnett, Gertrude Fredericka Barnett, Ruth Harriet Barnett and Harriet N. Moore. She was an office clerk, according to the 1900 census. George W. Barnett and Elizabeth Kammerer appeared in the US federal census of 15 April 1910 in Buffalo, Erie County, New York, at 123 Waverly Street. Other members of the household included Elizabeth Susan Barnett, George Jacob Barnett, Gertrude Fredericka Barnett and Ruth Harriet Barnett. She was a saleslady in a department store, according to the 1910 census. George W. Barnett and Elizabeth Kammerer appeared in the US federal census of 1 April 1930 in Buffalo, New York, at 123 Waverly Street. Other members of the household included Elizabeth Susan Barnett, Ruth Harriet Barnett. She was a department clerk, according to the 1930 census. George Jacob Barnett registered for the draft in 1942 while living at 2025 Broadway, New York City, and self-employed there. He lists as contact person his sister, Elizabeth Barnett, at 367 Westmoreland, Snyder, New York. Elizabeth Susan Barnett died on 15 December 1948 at age 71 never having married.